We were heartbroken to learn of the passing of Colton Groome & Company’s Founding First-Lady, Mrs. Marie Colton. Marie was the wife of Colton Groome’s Founder, Henry E. Colton, who passed in 2011. According to Marie’s daughter, Dr. Elizabeth Colton, Marie passed peacefully in the early morning hours on Tuesday, September 25, 2018. Marie was one month shy of her 96th birthday. Mrs. Marie Colton was a professional powerhouse, and a force to be reckoned with as a House Representative in Raleigh. She served her elected House seat for 16 years, from 1978 to 1994. 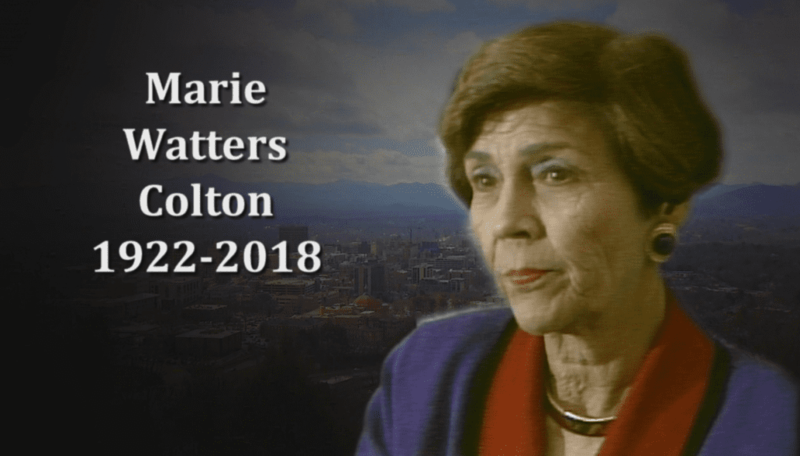 Marie was known for taking on controversial issues: pushing bills to tighten state regulations on stream sediment, improving day cares, and decreasing the use of corporal punishment in school systems. Representative Susan Fisher and Senator Terry Van Duyn referred to Mrs. Colton as an “Early Champion of Issues”. We, at Colton Groome & Company, were blessed to know this lovely woman first-hand. Mrs. Marie Colton’s memorial service is set for October 6, 2018, at Trinity Episcopal Church in Asheville.